There are countless natural wonders in North Carolina, and you have to look no further than the beauty of our state and national parks. North Carolina’s state and national parks offer bountiful opportunities to get outside and explore nature’s wonders. From hiking to the summit of Eastern America’s tallest peak to relaxing on the undeveloped beaches of the Outer Banks, here are 10 park visits to add to your plans. As the highest point in the East, Mount Mitchell’s 6,684-foot summit overlook platform affords some of the longest mountain views in North Carolina. On clear days, you can see as far as 85 miles. The elevation also contributes to chilly or cool temperatures year-round. The mountain’s spruce-fir ecosystem is home to flora and fauna, more closely resembling that of New England and Canada than the surrounding Southeast. One of the best ways to experience Mount Mitchell’s ecological diversity is hiking one or more of the mountain’s seven trails. The barrier islands that separate the Pamlico Sound and Atlantic Ocean are a state and national treasure. 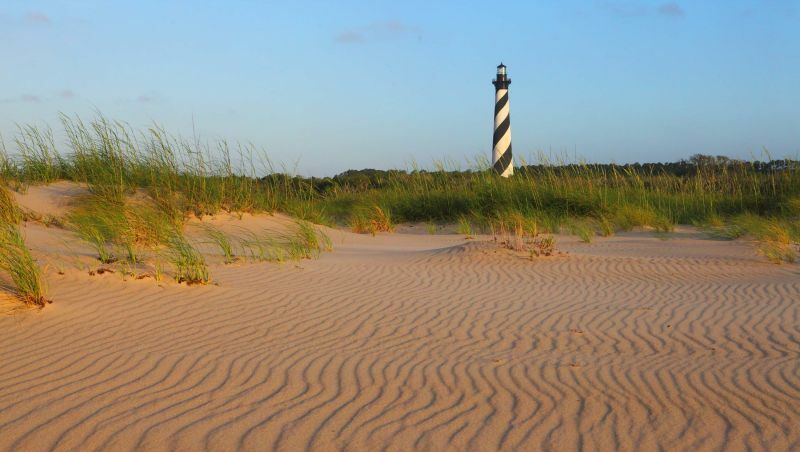 Cape Hatteras National Seashore stretches from Bodie Island on the north end southward to Ocracoke Island. In between, you’ll find miles of pristine beaches, marshes teeming with wildlife and iconic structures. The Cape Hatteras Lighthouse – the tallest brick lighthouse in the United States – is a stunning sight. Climb its 257 steps for a 360-degree view. Catch one of the ferries that service the islands and enjoy the views from the water. Cape Lookout National Seashore might comprise remote barrier islands, but it has plenty of options once you arrive. You can swim, kayak, fish, camp or simply soak in the sun. On this portion of the Crystal Coast and in its surrounding waters, you can find four species of sea turtles, more than 250 species of birds and a herd of wild horses. 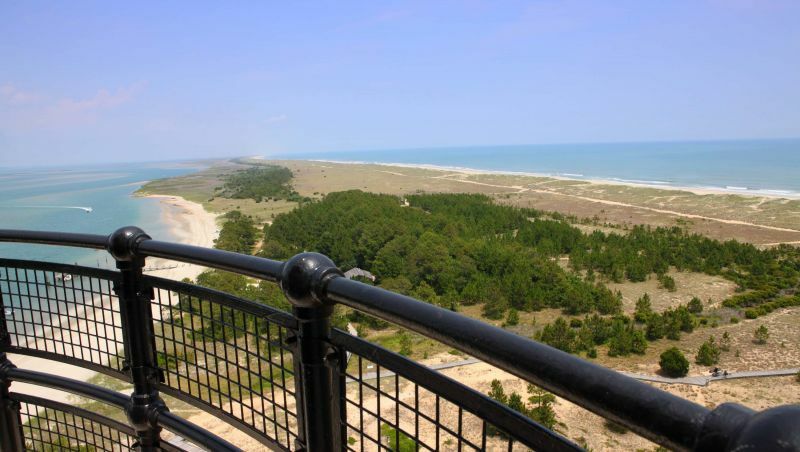 Ascend 207 steps to the top of Cape Lookout Lighthouse and take in the sweeping coastal landscape from above. 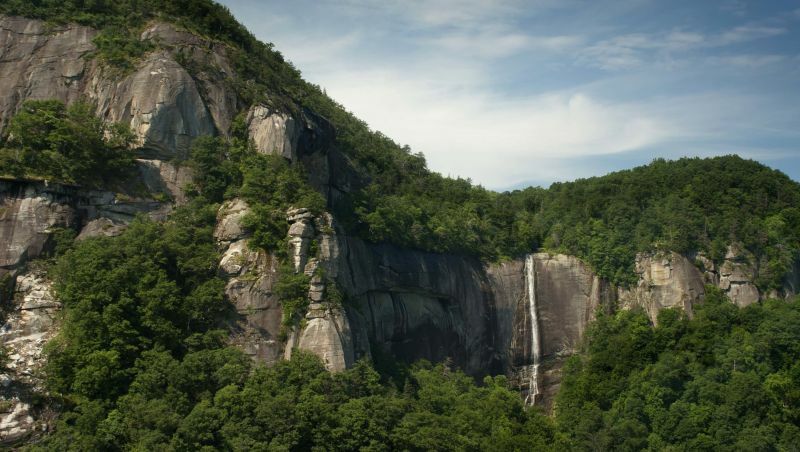 An icon in Western North Carolina, Chimney Rock Mountain is the centerpiece of this state park about an hour southeast of Asheville. 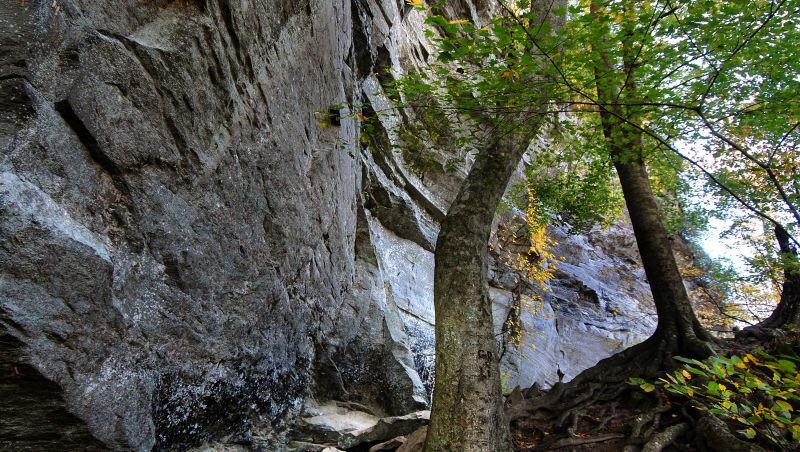 Climb the 26 stories of stairs that make up the Outcroppings Trail to reach the top and enjoy views of Hickory Nut Gorge, Lake Lure and the Piedmont region to the east. The Skyline Trail brings you to Exclamation Point, the highest peak in the park at 2,480 feet. The views from this route might look familiar; several scenes from The Last of the Mohicans movie were filmed here. Fort Fisher interests history buffs, birders, beachgoers and the environmentally conscious. Five miles south of Carolina Beach in the Wilmington area, the fort was built in 1861 to defend the Confederacy. Then during World War II, the fort was used as a firing range for training military personnel. The grounds are more peaceful these days as visitors stroll along the marsh-lined boardwalks. Each season brings different natural wonders, from nesting loggerhead sea turtles to migrating warblers, hawks and peregrine falcons. Five miles of undeveloped shoreline make for a relaxing day at the beach. One of the most appreciated features of Goose Creek State Park – located in rural eastern North Carolina outside of Washington – is the quiet. Come to this park to unwind, have a leisurely paddle along the creek and spend quality time camping with family and friends. 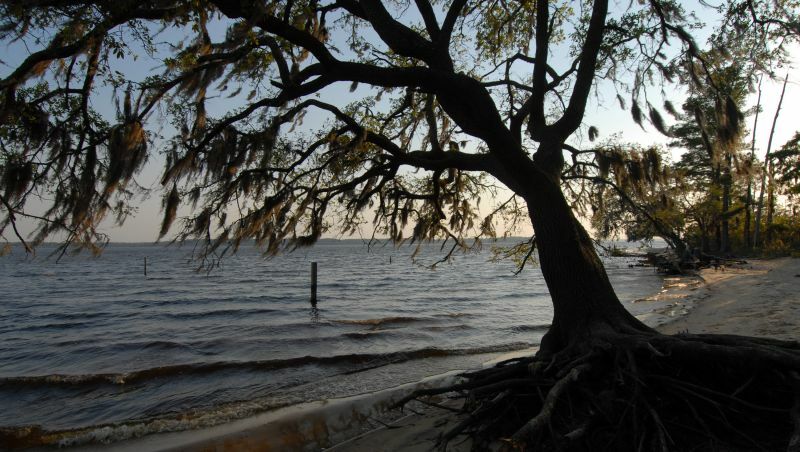 Bordered by Goose Creek, Mallard Creek and the Pamlico River, the park’s picturesque banks have trees with Spanish-moss-laden branches that reach out over the water. Eight miles of trails lead to marshes and swamps that earned the site a National Natural Landmark designation. With 2,456 acres of rugged backcountry, Grandfather Mountain State Park is ideal for the experienced hiker who enjoys a challenge. Not to be confused with the area of Grandfather Mountain that’s operated by a foundation (and known for the Mile High Swinging Bridge), the state park preserves an undeveloped area that’s home to more than 70 rare and endangered species. The Nuwati Trail, the only one rated “easy,” will take you to Storyteller’s Rock with views of Boone Bowl and Calloway Peak. For adventure-seekers, the Daniel Boone Scout Trail (rated strenuous) ascends about 2,000 feet across 3 miles, with the upper half offering incredible sights of the Linn Cove Viaduct. Additionally, hiking Black Rock Trail (accessible from the foundation attraction's parking lot) will earn you views of the famous swinging bridge. With more than half of its vast acreage in North Carolina, Great Smoky Mountains National Park is the most-visited national park in the country. If you prefer a rolling view, i.e., from the car, Cataloochee Valley at the park’s eastern edge is a popular destination for spotting elk. For hikers, a short journey through the Deep Creek area along the southern border brings you to three waterfalls: Juney Whank, Indian Creek and Tom Branch. This area is also filled with flowering plants, such as sweet shrub and rhododendron. 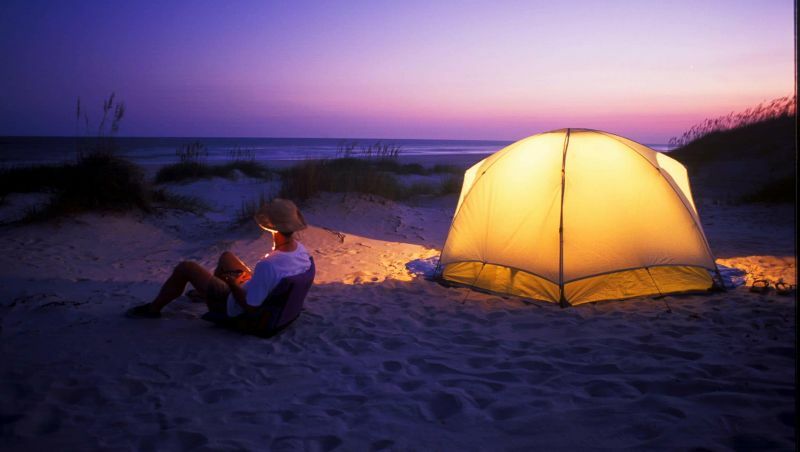 For those who enjoy unspoiled shores, Hammocks Beach State Park in Swansboro is your sanctuary. Only 33 acres of the park are located on the mainland. The premier feature here is Bear Island, accessible by ferry, boat, canoe or kayak. The 892-acre island is 3.5 miles long and less than a mile wide with more than 3 miles of beach. The island is a prime location for hunting shells. The beach is also a popular destination for nesting loggerhead sea turtles. Located at the intersection of the central and coastal regions, Raven Rock State Park boasts varied topography and ecosystems. A 2.5-mile loop trail leads to the namesake Raven Rock. Carved by wind and water, the 150-foot cliff was once a navigational landmark for river pilots. Getting to the top requires scaling 135 stairs, but the journey is worth it when you reach the overlook with a view of the Cape Fear River. In early spring, Raven Rock is a favorite spot to see wildflowers in bloom.